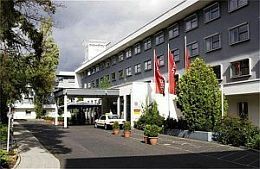 Frankfurt airport hotels offer accommodation for business travellers and holidaymakers, as well as a wide range of conference facilities. Located only 12km southwest of the city centre, visitors can reach the main Frankfurt attractions and the fair grounds within 15 to 20 minutes by public transport. ICE trains run from the long distance train station to major cities in Germany. Frankfurter Kreuz, the busiest motorway intersection (Autobahnkreuz) is just at the tip of the airport. From here you can drive into all directions, Cologne in the west, Hannover, Hamburg and Berlin in the north, and Stuttgart, Munich and Freiburg in the south. 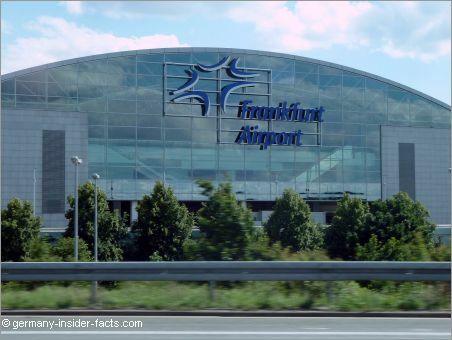 Frankfurt international airport (also known as Fraport) is the largest in Germany. Nevertheless, modern Frankfurt airport hotels are soundproof and convenient, great to recover from a long flight before you do business or continue your journey in Germany. The airport is always expanding, the new northwest runway (landings only) started operation in winter 2011/2012. A third Terminal is also in planning stage. The "New Work City" in the Squaire, a spectacular building above the long-distance train station, offers conference facilities, a business club, shopping and recreation opportunities. Gateway Gardens Business Park, a former American housing area, is said to be the prototype for a working city of tomorrow, only 800m from Terminal 2. Of course, all these new developments in the Airport City offer hotels in the best locations. 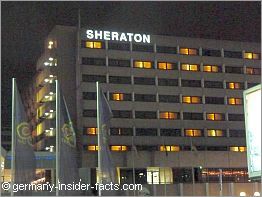 The Sheraton is just a few steps from Terminal 1, you can't stay closer to the airport than here. The hotel has more than 1000 rooms and several conference & banquet rooms for your business meetings. Four restaurants/bars and a fitness centre cater for visitors needs. 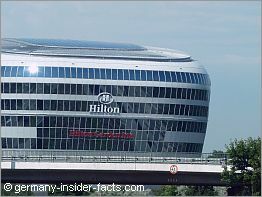 This brand new Hilton Hotel, located in the futuristic Squaire, opened in autumn 2011. Choose from comfortable king, queen or twin rooms that have all modern amenities, and of course sound proof windows. Integrated US and UK power sockets in the desks are convenient for international travellers. Compare prices and make your reservation for the Hilton Hotel. Also located in the Squaire, the Hilton Garden Inn Airport offers modern rooms and facilities for budget-conscious travellers. Both Hilton hotels have pedestrian access to Terminal 1 and the long-distance train station. Located in CargoCity South the InterCity is a four star hotel with 360 rooms and 15 meeting rooms. The unique JU 52 pub is open daily from 3pm to 1am, while restaurant Fluggi opens daily for breakfast, lunch and dinner. Guests of the hotel get a free ticket for public transport (S-Bahn, U-Bahn and buses) within the Frankfurt area. This hotel opened 2010 in the Gateway Gardens business park. It has 209 standard rooms and additionally business friendly rooms on the top floor of the hotel. The latter feature breakfast buffet and coffee & tea facilities. All rooms have wireless, high-speed internet access. A fitness centre, restaurant and a modern conference centre meet the needs of travellers. 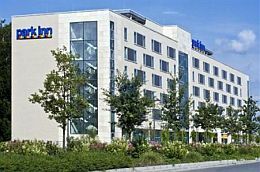 There are more hotels in Kelsterbach and Mörfelden-Walldorf. Both towns are fairly close to the airport and you will find less expensive hotels there. 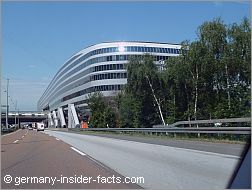 Most Frankfurt Airport Hotels have shuttle bus services running to the terminals. Some hotels offer completely free bus service, while other charge a few Euros. Sometimes the bus from the terminal to the hotel is free, but from the hotel to the terminal passengers have to pay. 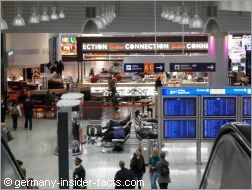 Have a good flight, a wonderful stay at one of the Frankfurt airport hotels and enjoy your visit to Frankfurt. 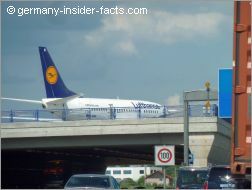 When you drive on the A3 motorway it can happen that an airplane crosses the bridge over the Autobahn.